Deloria Many Grey Horses-Violich is a proud member of the Kainai Nation – from the Blackfoot Confederacy, the Chickasaw and the Yankton Sioux Nations. She is an urban First Nations woman dedicated to creating change and advocating for Indigenous Rights through her writing, film, photography, and all other forms of self-expression. Deloria believes that art is a gentle and beautiful form of resistance and celebration. Deloria’s practice currently migrates between Santa Cruz, California as well as Calgary and area. 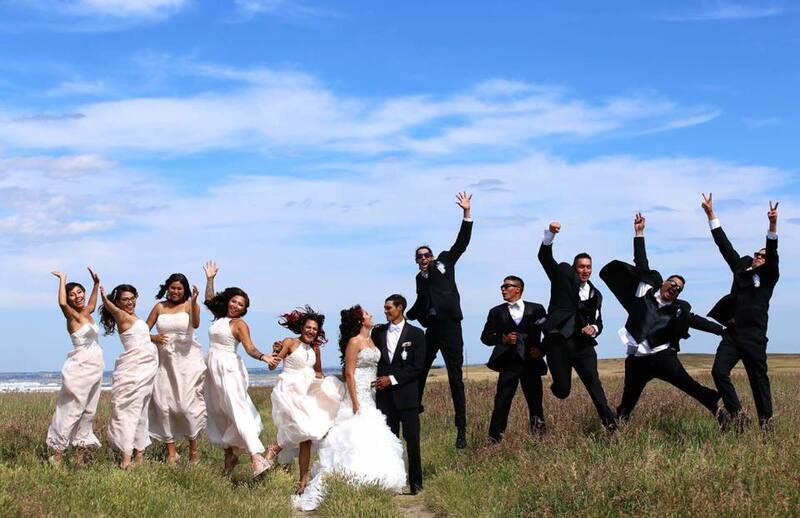 It was on Treaty 7 territory that the idea for a healthy families’ portrait project was born. Deloria tell us more about how the project began. How did the photography project fit in to your view of art as resistance and celebration? I think that our people grow up hearing and seeing negative stereotypes, my goal was to oppose this. Children are at the centre of our culture, women next, and our Elders. So a project about family and their relationships came into focus for me. The people I look up to talk about the importance of our families. I know the people of Treaty 7 are beautiful - I wanted to show this. As I started working on the project, I also had my own memories of visiting Head-Smashed-In Buffalo Jump and realizing that this was the first time I saw myself. I had an emotional reaction to this, a sadness. So part of the project is to contribute to spaces where our communities and families, youth in particular can see themselves in a beautiful way. Meet couple Shalome Hope and Thomas Snow. Shalome Hope is of Cree-Metis Heritage and was born in Caglary, Alberta. She is currently working on a BA in Womens Studies at the University of Calgary. 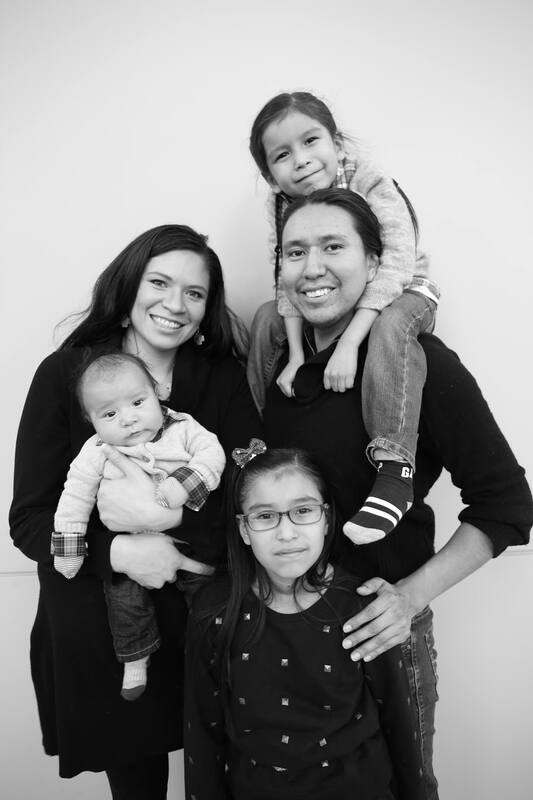 Shalome loves to sing, dance and act, is a recipient of the Chief David Crowchild Award and loves to nurture and grow her family of 6. Her wonderful partner is Thomas Snow. Thomas is a fluent speaker of Nakoda Sioux and comes from Mini Thni Wapta. he was raised in a traditional home and community. He is educated in his traditional teachings by elders from the Stoney Nakoda Nations and holds a degree in Social and Cultural Anthropology from the University of Calgary. They have 4 beautiful children, Savannah (11), Kali (9), Tata-peh (5), and Iyoxna U (7 months). 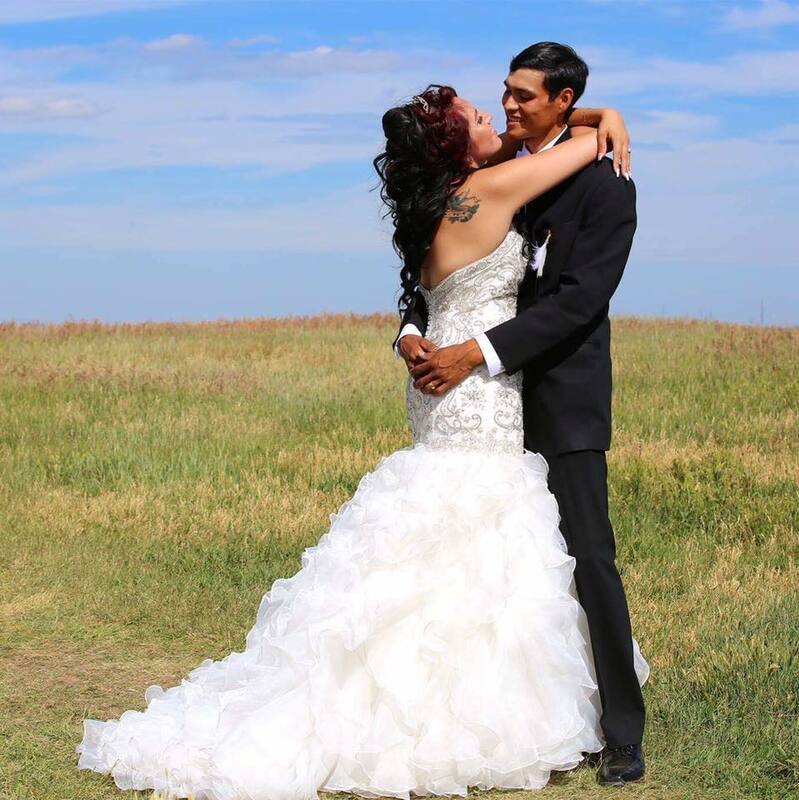 Larissa and Nolan Tail Feather on their wedding day - July 21, 2017 at Nose Hill Park in Calgary, Alberta. The idea of Deep Beauty was gifted to us by Angie-Pepper O'bomsawin during Otahpiaaki 2016. Pepper is the Director/Content Producer and tour de force behind the Princesses Series on APTN and was our guest last November. She described beauty that is intellectual, cultural, spiritual, physical… we find it in design and fashion, music and community, family and new experiences.What did you see through your lens? I saw these moments. Moments of relationship, of love, of excitement. For many of the families, this was the first time they were doing a photo session. I intentionally designed the sessions to be interactive and collaborative, ensuring each family was involved. Again, I think of historic photos of Indigenous people. In so many there is a sadness, there are no names, the photos were done to them, something was taken away in those portraits. I wanted to be highly collaborative. I invited their collaboration and their ownership in the process. Our communities are so strong and so resilient. I learned how resilient and beautiful our people are. Michelle Robinson really encouraged me and gave me confidence. Now I know it’s okay to take chances. It’s okay to follow your heart. Otahpiaaki is delighted to be exhibiting Deep Beauty: A Photo Exhibition of 30 Families from Treaty 7 by Deloria Many Grey Horses-Violich throughout Otahpiaaki 2017, at the Bella Concert Hall (September 18th & 19th), in Mainstreet at Mount Royal University (September 18th-21st ) and at the David Crowchild Memorial, City Hall Atrium, City of Calgary (September 21st, 22nd, 23rd).